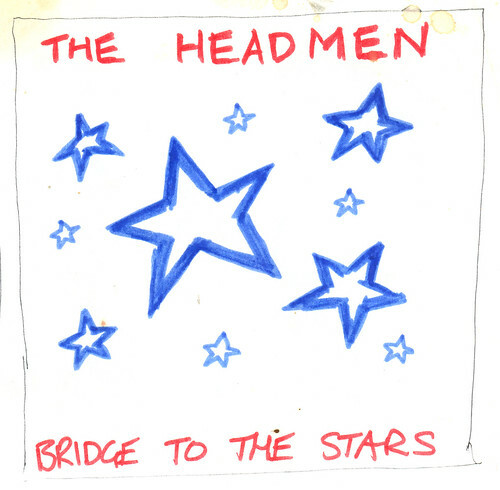 The Headmen | "Self-plagiarism is style"
17 years too late — it's "Bridge to the Stars"! 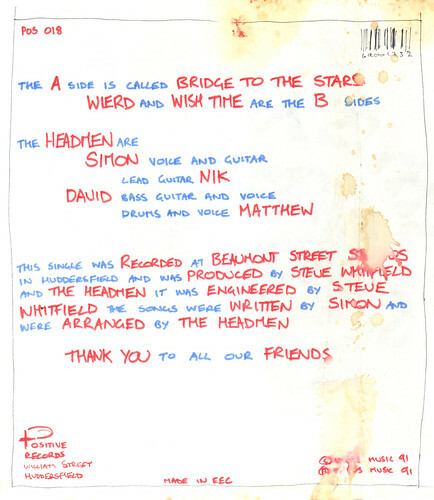 Regular readers will probably know that I used to be in a band (“The Headmen”) in the early 1990s. Thanks to Facebook, I’m back in touch with Simon, the singer/songwriter, and we’ve been busy converting all of our old cassette tapes to MP3. I’m so used to “digital” now that’s it strange to think that all of our studio recordings were done on reel-to-reel magnetic tape. The only time the word “digital” was ever mentioned was when the final studio mixes were sent off on a tiny DAT (Digital Audio Tape) to get pressed onto vinyl. Sadly, “Bridge to the Stars” never got released. 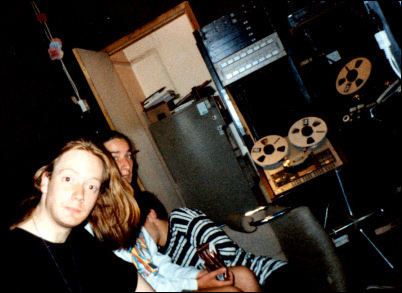 Not too long after the tracks got their initial mix, Beaumont Street Studios in Huddersfield was destroyed in a fire and all of our master tapes went up in smoke. 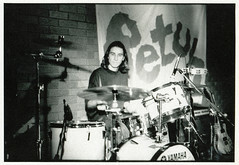 The following year we parted company from Positive Records and, a couple of years later, played our final gig as part of Bradford Festival 1994. Only 3 people were present for that initial mix — Steve Whitfield, our drummer Matthew, and myself. At the end of the evening, Matthew and I walked away with a cassette tape each of the mixes. Within a couple of weeks, I’d lent my copy to someone and never saw it again. Fortunately, Matthew was a little more careful with his copy and, only 17 years too late, I’m proud to give the EP a semi-official release! 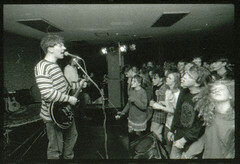 The tracks are also available on Last.FM. Listening to the tape, it blew away a serious amount of cobwebbage — I had to listen to “We All Fall Down” 3 times before I could even remember playing bass on it! I remember there was even talk about filming a cheesy video for “Bridge to the Stars”, with cardboard cutout spaceships and tinfoil spacesuits. 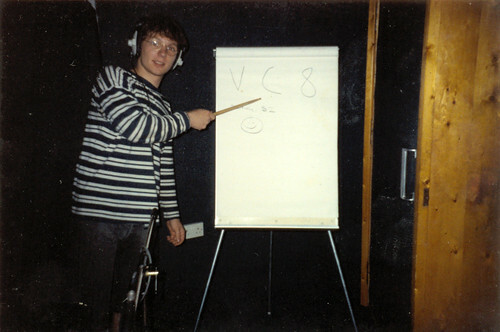 At the time, both Simon and I worked at the Tesco supermarket in Brighouse and, one lunchtime in the staff canteen, Simon doodled the artwork for the EP. As you can see, I then managed to spill my coffee over half of it!!! 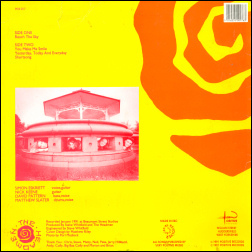 Curiously, the artwork doesn’t mention “We All Fall Down” and I’m guessing “Wish Time” was the official title for “Song 52”? 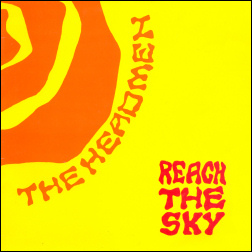 I mentioned that I used to be the bass player in a band (“The Headmen”) a while ago and it was great to hear that one or two people still listened to our stuff! – A quartet that was just briefly a trio! 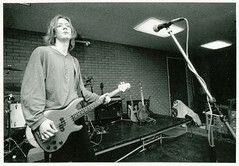 …I’ve absolutely no idea why the Huddersfield Examiner would want to reprint a 14 year old photograph of the band I used to be in …unless it was a very slow news day!!! 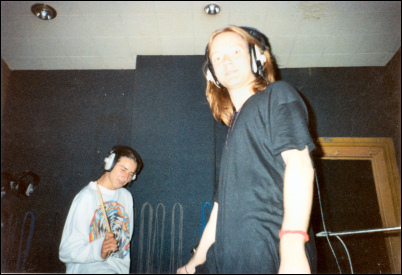 I can vaguely remember having to jump on the bus to Huddersfield after work (I used to work at the old Tesco supermarket in Brighouse) to have that photograph taken with Simon and Matthew — it was taken in the original Beaumont Street recording studio.